Yalkut Shimoni [Midrashic anthology to the Bible]. Attributed to Shimon the Preacher of Frankfurt. Two parts bound in one volume. 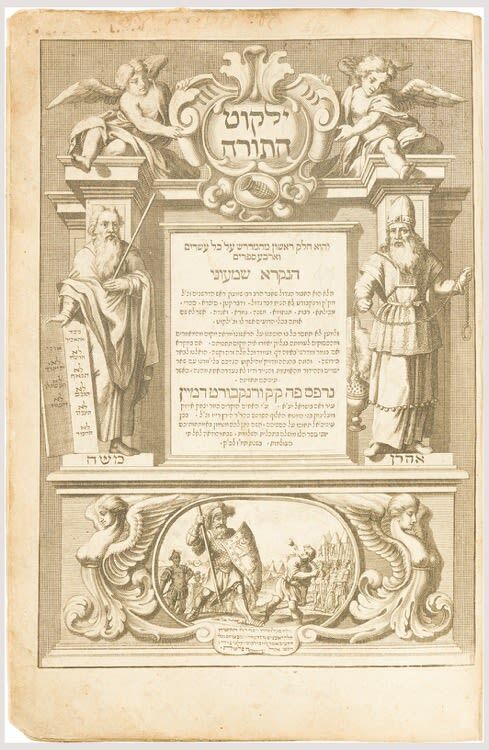 Magnificent engraved title-page featuring Moses and Aaron and roundelle vignette depicting the battle of David and Goliath. ff. 313, 190. Light wear. Contemporary vellum, worn. Thick folio. Vinograd, Frankfurt a/Main 72. Frankfurt a/Main: Isaac & Zeligman Reis, 1687.